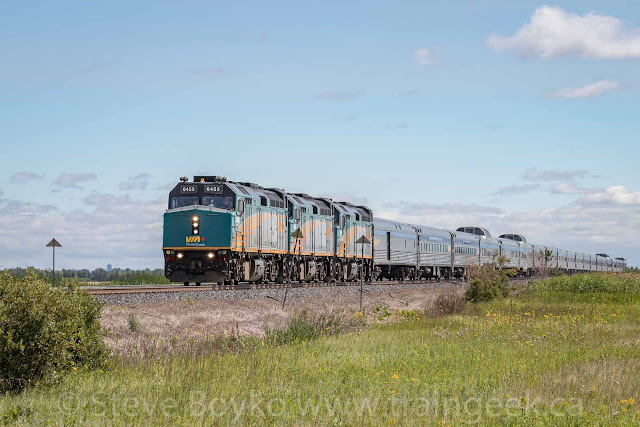 I am now blogging at www.traingeek.ca - please update your bookmarks. Thanks! 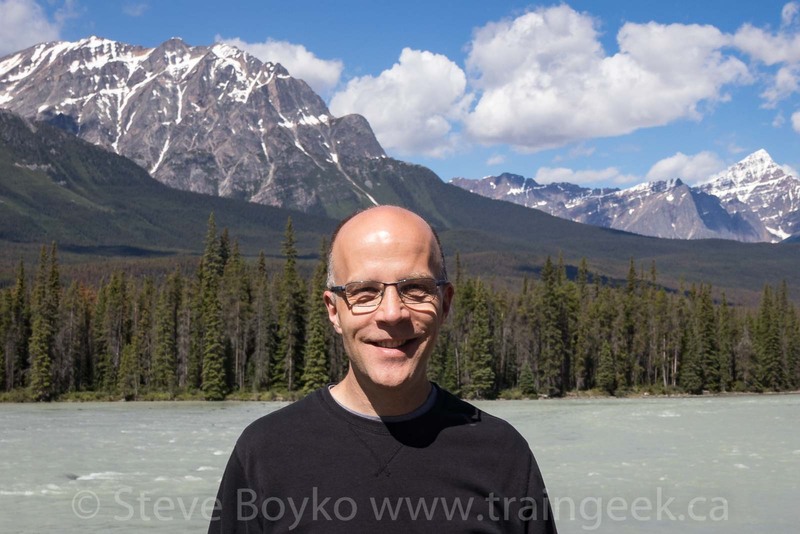 Sign up for my mailing list to receive notifications when new blog posts are made. If you use an RSS reader, you can use this link to see new posts. Monday, August 6th 2018 was a holiday here in Manitoba. It's called a "Civic Holiday" here, other provinces call it "Family Day" and it's not even a holiday in some provinces. Anyway, I had the day off. I went out to catch VIA's "Canadian" leaving Winnipeg. It turned out that the first train I saw was CN 8906 West - see above. I elected to catch it at Carman Junction at the curve, to get the head on view above. The train had CN 8906 / CN 5694 / CN 8823 on the head end. 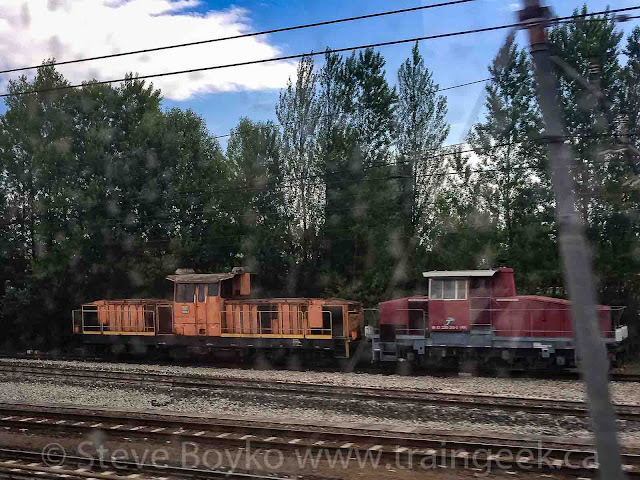 After the train passed, I went west to Diamond to set up for VIA. I caught up with some of the train so I amused myself by taking a few shots of the old wooden "Diamond" sign. I hope nobody steals this sign. 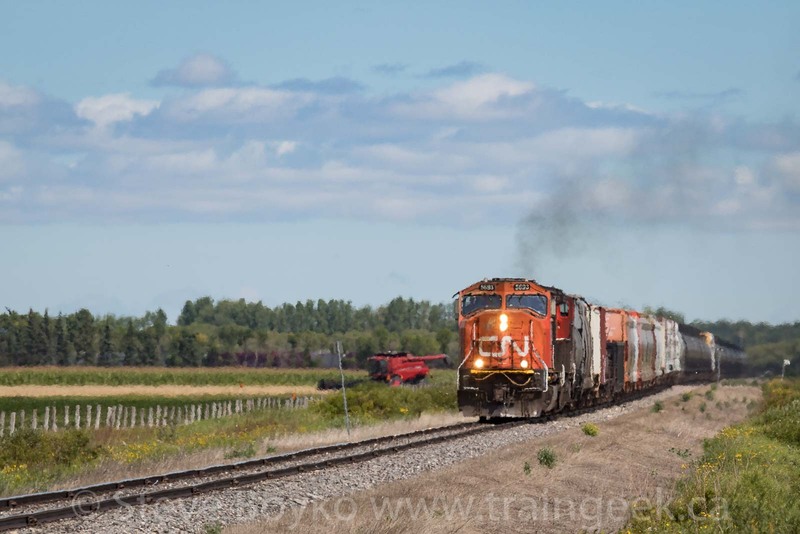 I got what I came for - VIA 6455 leading the "Canadian" with two other units and 20 cars. "Glacier Park" was on the tail end. Two Central Manitoba Railway GP9s, 4002 and 4004, were parked on the Carman subdivision. 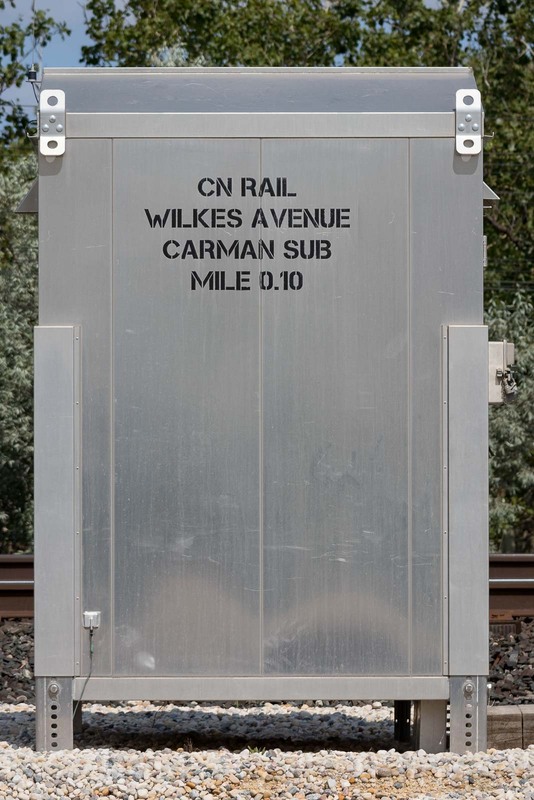 I noticed this shiny new equipment box in the gap between the main line and the track to the CEMR Carman subdivision. 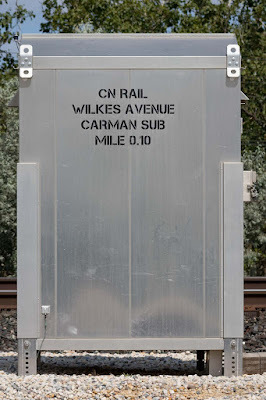 CN actually owns the first little bit of the track - from the Rivers sub across Wilkes Avenue - before it becomes the CEMR Carman sub. I didn't see anything happening after that on the CN Rivers subdivision, so I headed for home. 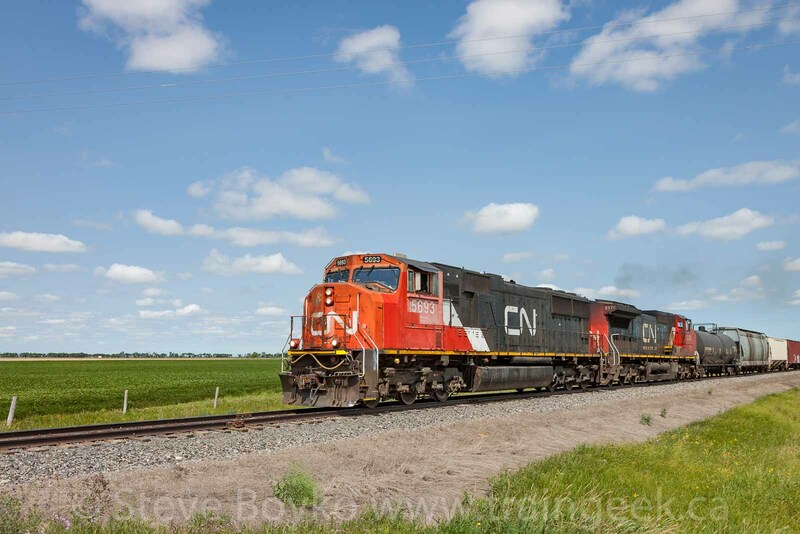 As I drove around the Perimeter Highway, I spotted a southbound CN train on the Letellier subdivision. That would have been CN 532, heading down to the Canada-US border at Emerson to interchange with BNSF. I gave chase as best I could. 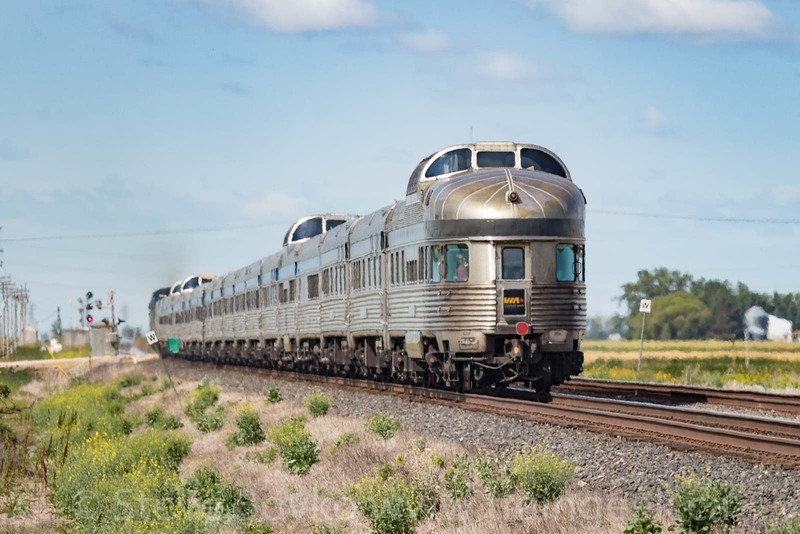 It was hard to catch up to the train through St. Norbert, given the 50 and 60 km/hr speed limits, but eventually I got ahead of them south of the town to get the shot above. I was on the "dark side" of the train and I wasn't super happy about that. Fortunately, they weren't going very fast, so after they passed by, I gave chase again... this time, at 100 km/hr! Near Ste. Agathe, I was far enough ahead of them that I felt I could leave the highway and drive the 2 km or so to the track for another round of photos. As it happened, I had enough time to get both my cameras out... one with the 70-200mm "long" lens and the other with the wide angle. First the long lens. There was a combine working a field nearby, so I included that in the photo. You can see a bit of heat haze, so the shot isn't as sharp as I would like, but I like what's in it! A few seconds later, I took another photo as the train approached. The right of way looks very clean and well maintained, doesn't it? I love that 70-200mm lens. 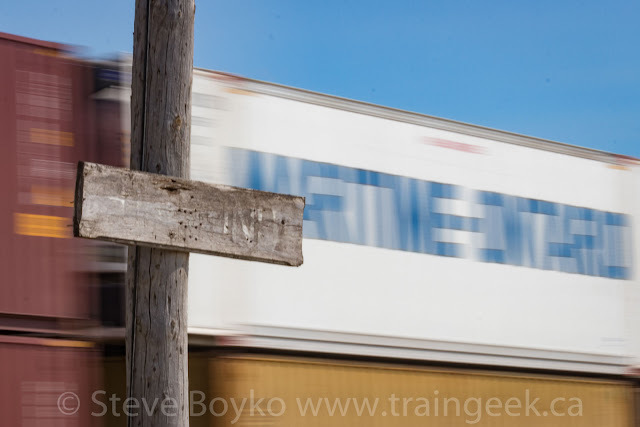 I "dropped" that camera and picked up my older T1i with the wide angle lens to capture the train as it went by. The train had a friendly crew who both gave me waves as they went by. Thanks! One going away shot, with the Viterra elevator at Ste. 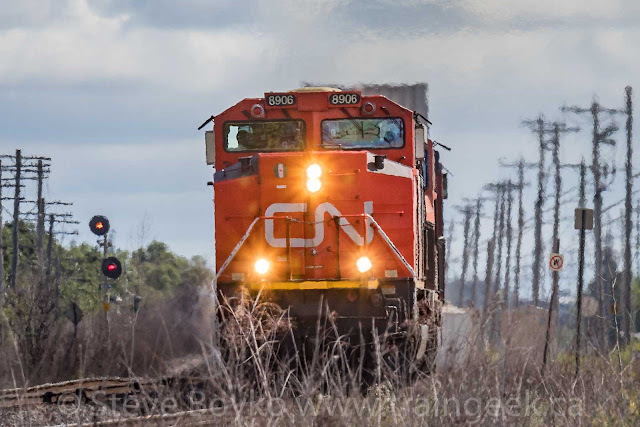 Agathe just to the left of the train, and the G3 SD40-2 locomotive at far left, on the loop track of the G3 elevator at Glenlea / Saint Adolphe. Here's the video showing all three trains, with a "clickbait" title just for fun. You might want to read Busy Day - same play, VIA 1 then CN 532, back in 2012! This was the last full post that I will write on blog.traingeek.ca. 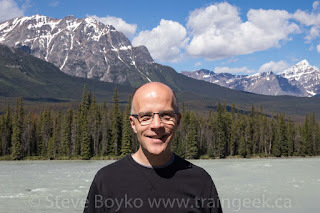 I've been on the Blogger platform for many years, since my first post in July 2005. After 13 years and 3 months, it's time to move on. From now on, I'll be writing on my main site - www.traingeek.ca - and the posts will appear there on the home page. I like the WordPress platform a lot more for writing. I've been thinking about this for a long time, more than a year, and now I'm making the change. I hope you'll follow me there. All of my old posts will remain where they are. I am not interested in moving them over! By the way, there will be one more post, a placeholder to direct visitors to my main site. This post is the last of a series on trains I saw and/or rode while on vacation in Italy. Start at the beginning if you like. I saw a number of trams / streetcars while my wife and I were in Rome. We never had a reason to ride one, but I made a point of photographing them on a few occasions. 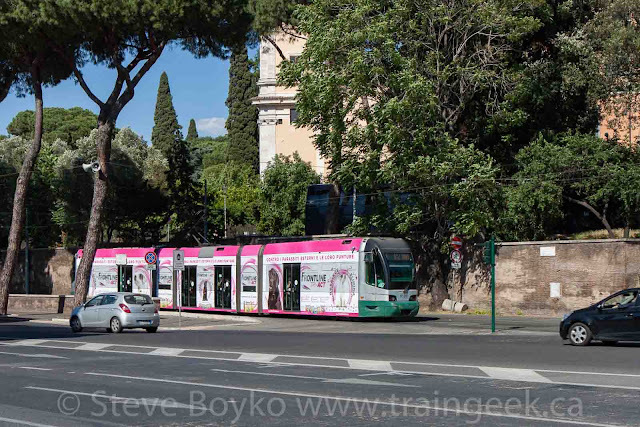 There are four types of trams running in Rome: ATAC 7000 series, SOCIMI, Cityway 1 and Cityway 2. The lead photo and the one below are Cityway 2 trams. These were manufactured by Fiat Ferrovia (now part of Alstom); the Rome Transport Company (Azienda dei Trasporti di Roma, ATAC) placed an order for 50 trams in 1998. They are bidirectional, full low floor trams operating on 600V DC and running on a track gauge of 1445mm (close to 4' 8.5"). 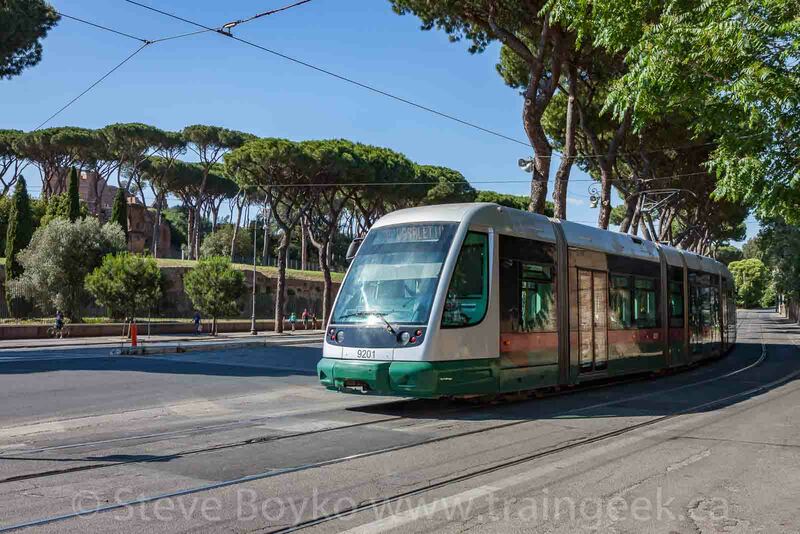 The next tram is a Cityway 1 tram, at the Termini train station in Rome. 28 of these were ordered by ATAC in 1996; they are partial low floor trams and are the same type of trams that were ordered by Turin, Italy in 1989. 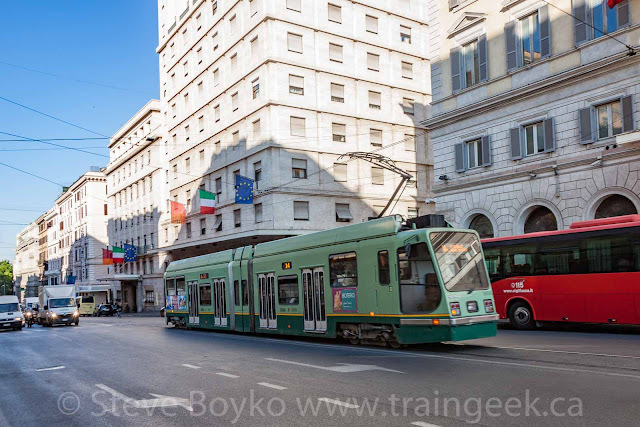 The next tram was built by Italian tram manufacturer SOCIMI, which went bankrupt during the production run. 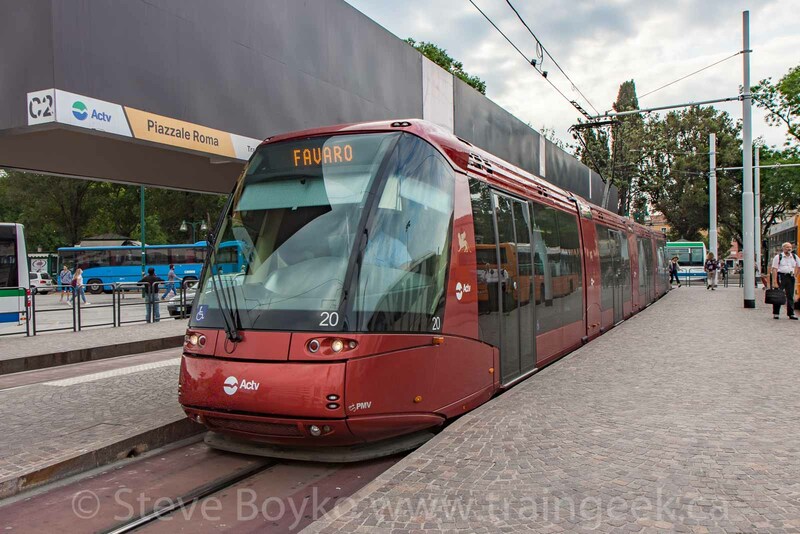 Here's one more tram, another Cityway 2 tram. There is one tram line in Florence. It was recently rebuilt (opening in 2010), long after it was closed in 1958. The line runs 11.5 km from Careggi, north of the main train station (Florence Santa Maria Novella), to Scandicci in southwest Florence. I did not take any photos of this, as the only portion of the line I would have seen was right by the train station. The tram line does not go near the Duomo area, where most tourists go. Believe it or not, there is tram service in Venice, Italy. 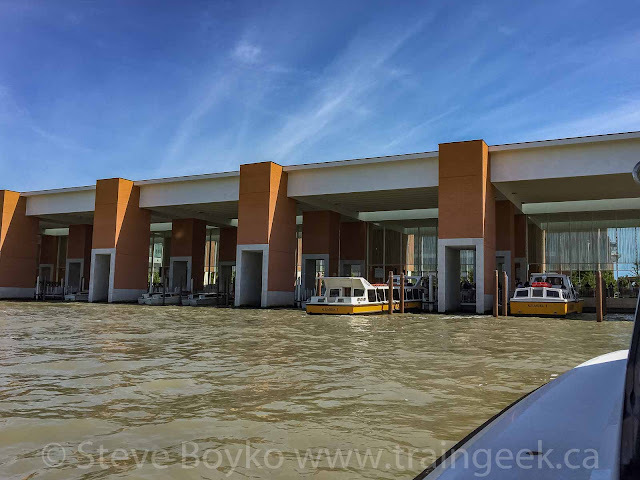 The tram system is mostly in the mainland portion of Venice, but it does operate over the causeway to the island portion to a spot near the train station. 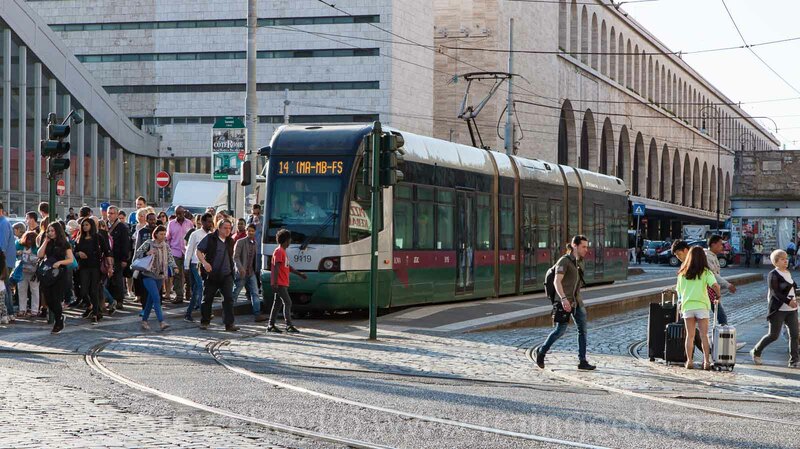 These are Translohr rubber-tired trams, originally developed by the French company Lohr and now built by a consortium that includes Alstom. Although they run on rubber tires, they use a single rail to guide the tram along the route. We did not ride these trams. 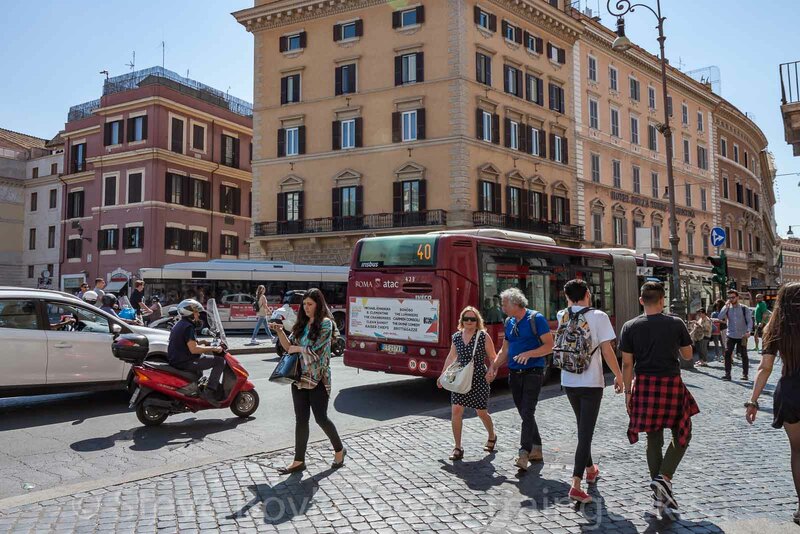 Here are two photos of buses, for those who like them! That concludes my series on trains (and trams) in Italy. Thanks for reading! 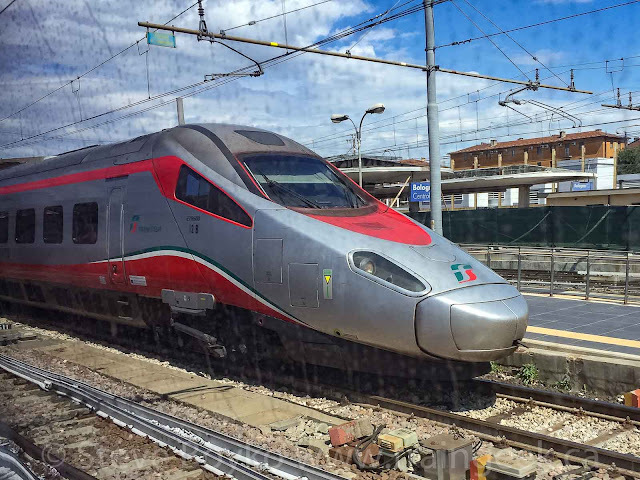 This post is part of a series on trains I saw and/or rode while on vacation in Italy. Start at the beginning if you like. After a few days in Florence, it was time to move on to our final Italian stop - Venice. 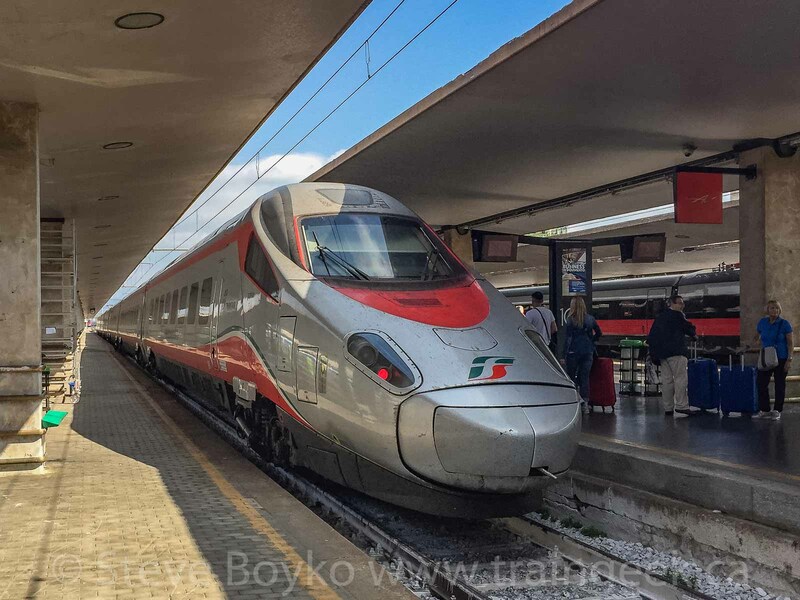 We took a Frecciargento train between Florence and Venice. Frecciargento means "silver arrow" in Italian, and these trains can reach speeds up to 250 km/hr. Zoom zoom! My wife and I both had window seats, facing each other. I was facing backward, but that didn't really bother me. The other two seats in our little group of 4 contained two loud Russians. My wife slept much of the trip and I kept my headphones in. I snapped a few photos along the way with my cellphone. 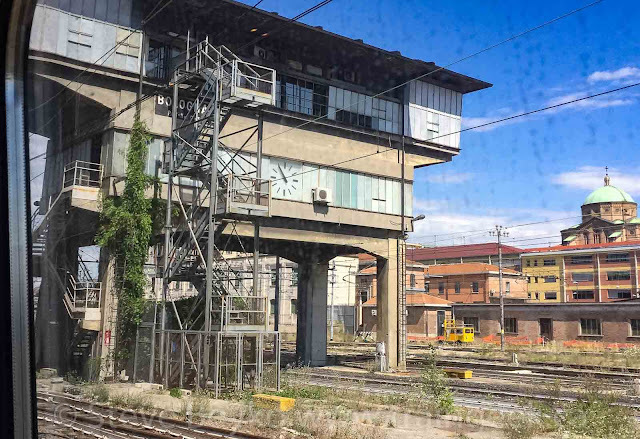 I'm not sure what this structure was in Bologna - another tower, maybe - but it was impressive. 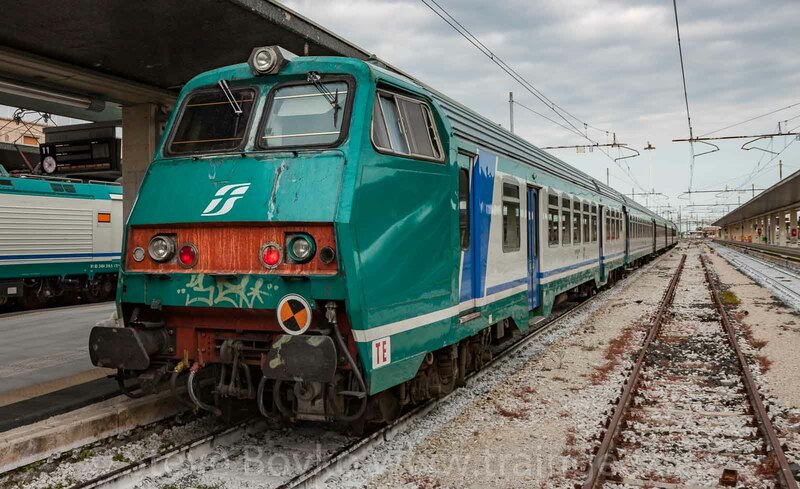 I spotted this EuroSprinter (Siemens ES 64) locomotive later on. 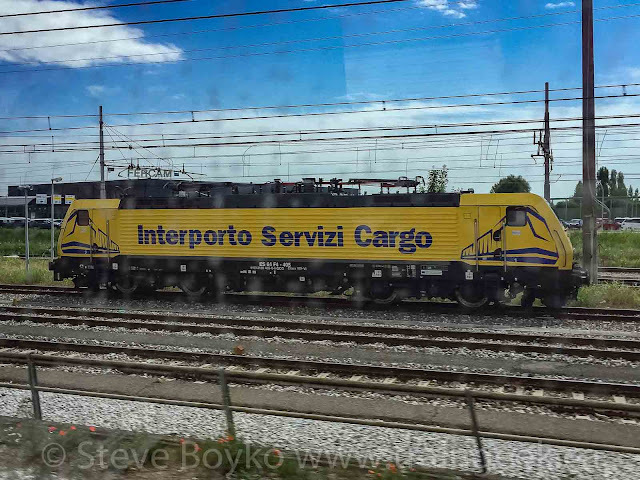 It's owned by Interporto Servizi Cargo, an intermodal railway in Italy. 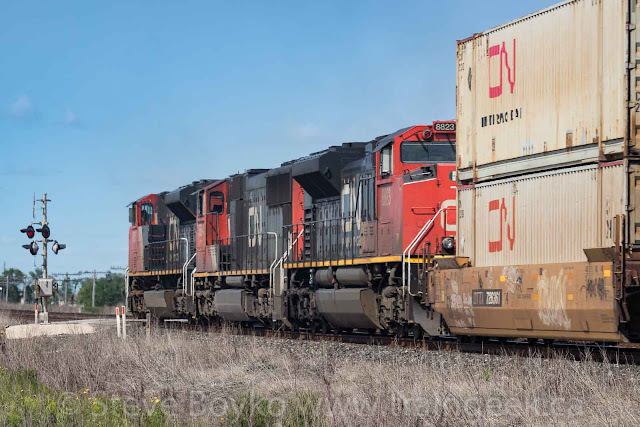 They own their own locomotives - electric and diesel - and about a hundred well cars for carrying containers. I like seeing the European rolling stock - wagons - as they are very different from North American freight cars. Of course, I always have a soft spot for small diesel locomotives. After two hours, we were on the causeway linking Venice to the mainland. This causeway carries both road and rail traffic to the city. Transportation in Venice is by foot, or by canal. Cars and trucks arriving via this causeway can basically only drive in a small portion of the city (Santa Croce, the port area). 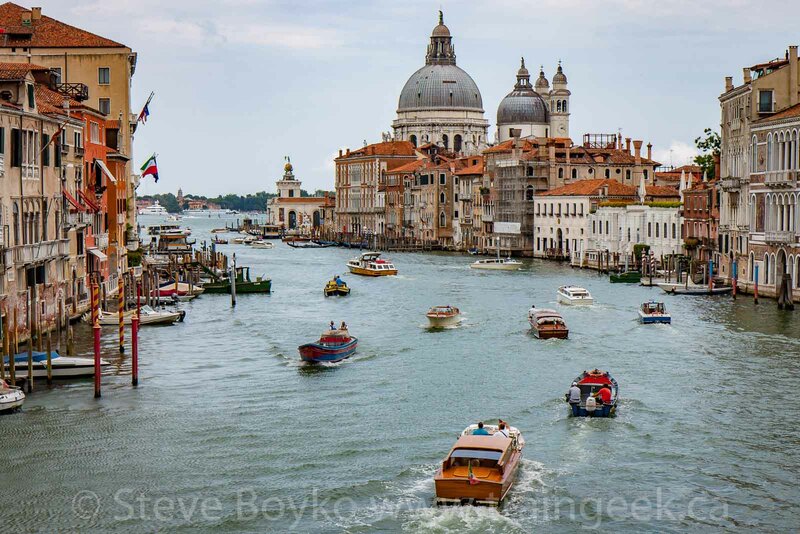 Much has been written about how tourism is destroying Venice. 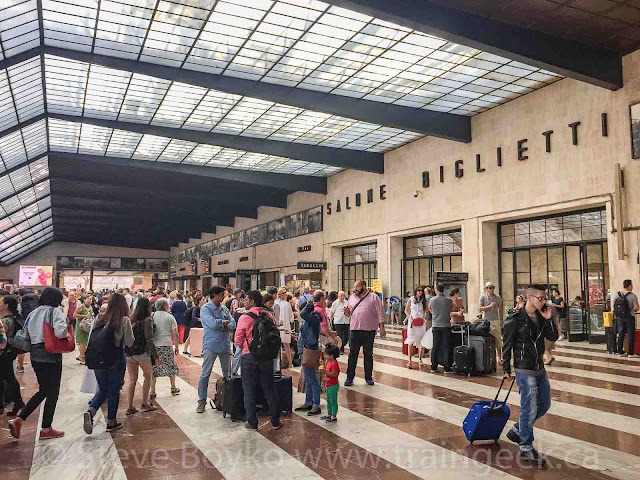 The city was obviously not built for the volume of tourists that stay (4.6 million people stayed at least one night in Venice in 2016), never mind the huge number of day-trippers by bus or cruise ship. In 2015 it received 30 million visitors. Services like Airbnb have resulted in landlords jacking up rents to force residents out, so they can sell their apartments to short-term rentals for much higher prices. This is not limited to Venice, as other cities like Barcelona have the same issue. I don't know what the solution is. The population of Venice is shrinking, the buildings are falling apart (and sinking), and there's no end in sight. 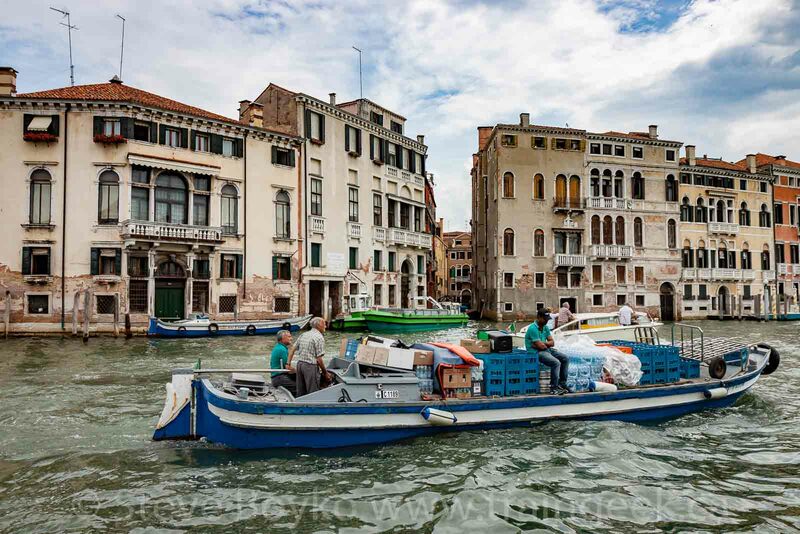 Get there while you can, before Venice turns into an unoccupied museum. We stayed in a hotel near the train station - the excellent Ca' Pozzo - so we didn't have far to haul our luggage. 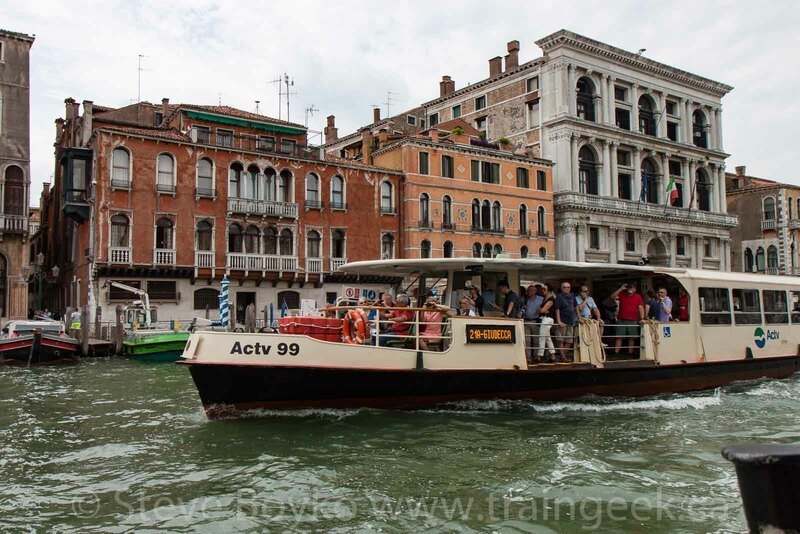 That was good, because if you walk any distance in Venice, you're going over a bridge. 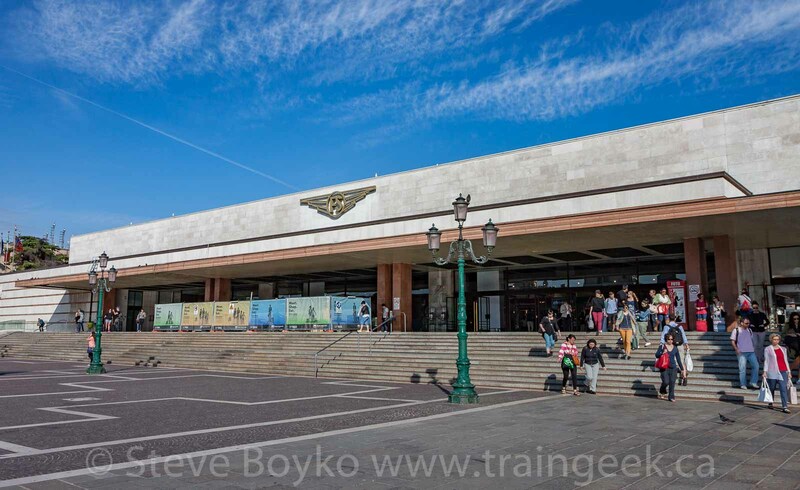 The nice thing about being near the station is that it was easy to walk over to take a few photos now and then! 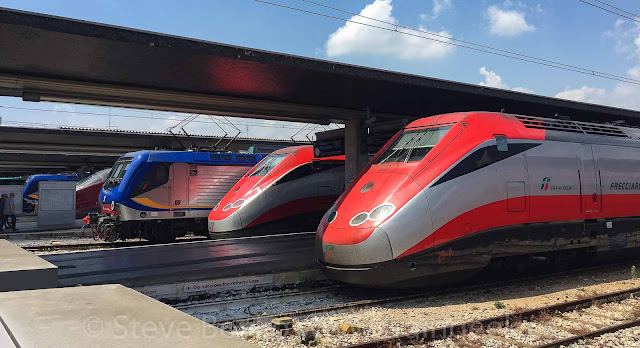 Here's a few trains I saw at the train station in Venice. 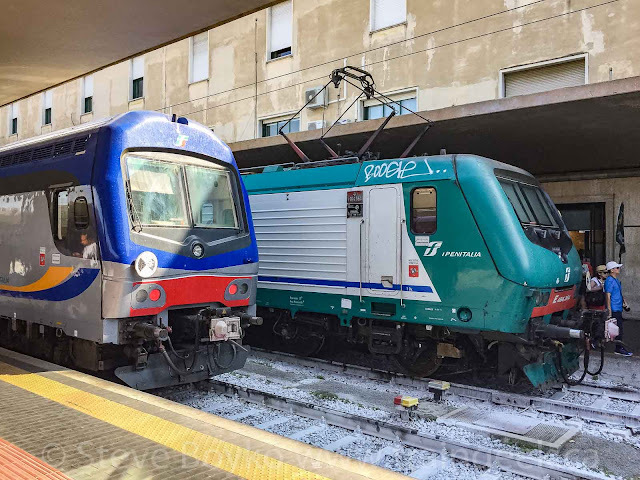 The below two trains were interesting. Italo is a privately owned company, in direct competition with state-owned Trenitalia on the Milan-Naples and Turin-Venice routes. 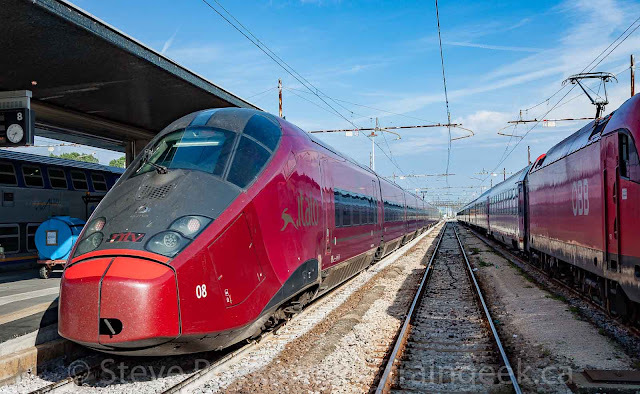 ÖBB is the Austrian national railway (see my Austrian railway series). 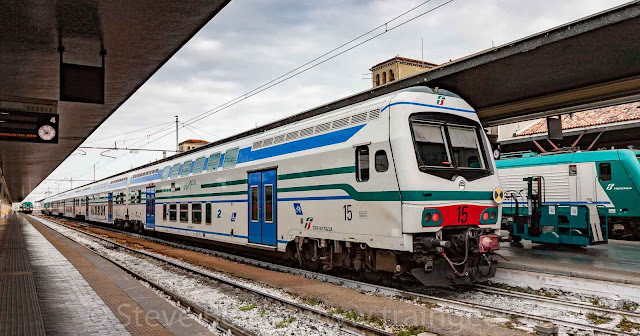 I liked this bilevel train too. I ended up going to the train station two mornings to record trains. 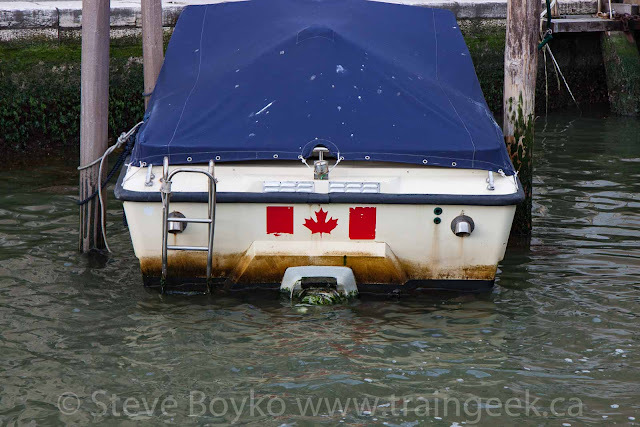 There are so many boats in Venice. This is to be expected, given that it's the only motorized way to get around the city, but it's still surprising to see so many of them. 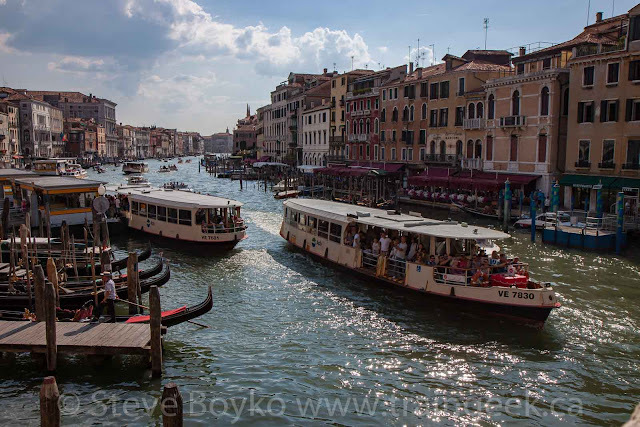 From vaporetti (water buses) through water taxis to gondolas, there is a lot of passenger traffic on the Grand Canal and smaller canals. These are real city buses, with schedules, electronic displays, bus passes, the whole shebang. Of course, the city needs food, water, and many other goods, and those get around in various sizes of cargo vessels. Gondolas are for tourists, not for transportation. We did take a gondola ride and thoroughly enjoyed it. 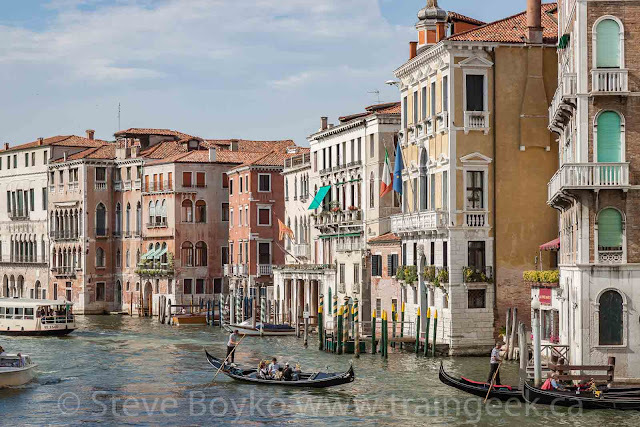 The Rialto bridge and St. Mark's Square are well known Venice landmarks. However, I'd say the whole city is a landmark and deserves to be explored. We could honestly have spent another week in the city and not finished wandering its twisty streets and canals. I was surprised to see a Canadian connection! 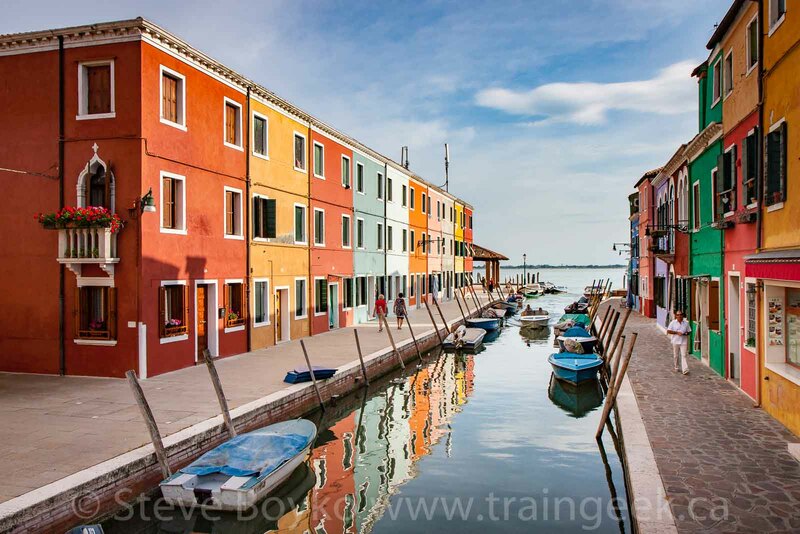 The most beautiful part of Venice, in our opinion, is the island of Burano. This place was picture perfect. 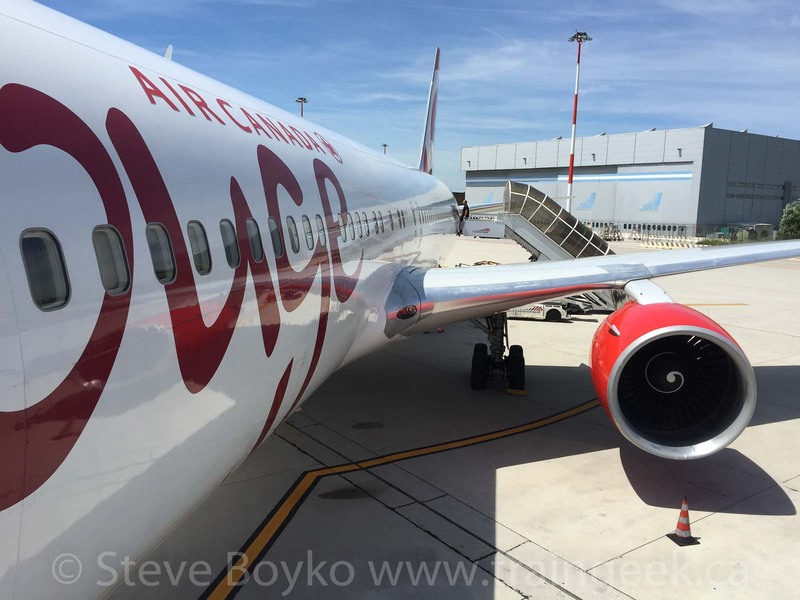 After waiting in a long line to pass through Customs, we headed out to our Air Canada Rouge plane for the long flight over the Atlantic toward home. This isn't the end of the series, though. 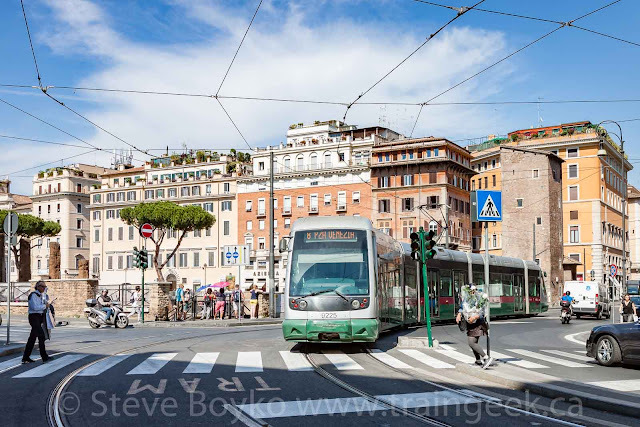 I have one more post to make about the trams I saw in Italy. It'll be relatively short.